Have you heard of Project Run and Play? Blogging designers, kids clothes, contest, short deadlines, you get the drift. Now they have a sister site called Project Sewn, and this season's competition starts today! I am not yet an awesome enough blogger/clothing designer/sewer to be one of the official contestants, but they have a sew-along division for us regular folks! Boo wanted in on the photo shoot. And she loves to be with her aunt. Please vote for me starting Friday morning! The finished product looks awesome! :) Love it!! Dude! Nice job! Love the white with the black lining and that waistband is awesome!! I love this skirt. And your photos were great! 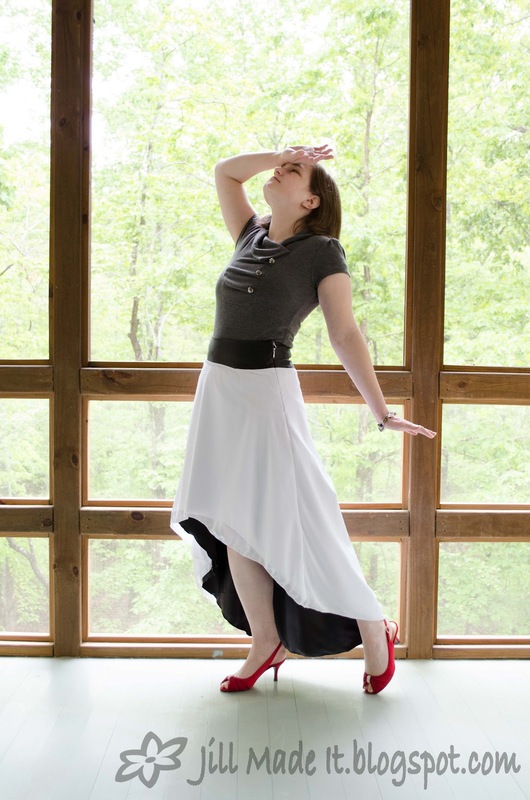 The skirt and photo's are both wonderful and inspiring. Great work. I love it. Nice fabric choice. Oh and yes, love the red shoes with the black and white. I tried commenting from my phone, but it didn't work. Just wanted to say that this skirt is too cute! I wish I had one. Oh, and I nominated your blog for the Liebster award. You totally deserve it. Be sure to swing by to see what all the fuss is about. I love that this skirt is high contrast in just one item. This look like so flowly and has beautiful drape.